Kosuke Maruboshi (まるぼしコスケ, Maruboshi Kosuke) is a genin of Konohagakure, whom others called the Ten-Thousand-Year Genin (万年下忍, Mannen Genin). 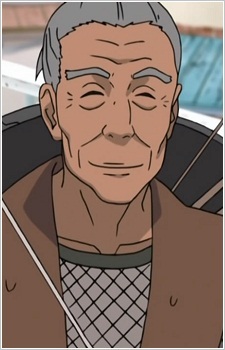 Kosuke has been a genin for over fifty years, thus the reason others called him the Ten-Thousand-Year Genin. When he was still a child, he made a reckless decision that cost him the lives of his teammates. Feeling ashamed of this, he felt he was not worthy of being promoted beyond the rank of genin. Despite this, he continued to train arduously to improve his skills, something that was insisted upon him by Tobirama Senju. During his time as a ninja, he had served under the Second, Third, and Fourth Hokage and now apparently even the Fifth Hokage. At other points, he fought alongside Jiraiya and Sakumo Hatake. Kosuke is an elderly man with his once black hair now grayed which he wears in a short ponytail. He wears a mesh armor shirt under a short brown sleeveless kimono as well as gray pants. He is usually seen with a smile on his face. He carries a metal pan that he uses for multiple reasons ranging from cooking in while out on missions to a weapon during battle. He also carries a ladle and a sword sheathed horizontally across his lower back. Even though his official ranks is that of genin, he is skilled enough to become a Jōnin; a promotion he declined time and time again. He has shown considerable taijutsu skill, able to use only his cooking-ware to defend and maneuver against enemy attacks. He is also a skilled kenjutsu fighter and wields a sword and a hidden blade concealed in his prosthetic left leg, both of which he can use to strike with deadly precision. He also demonstrated the use of a unique technique which incorporated genjutsu along with kenjutsu to confuse and petrify his opponent, making it easier to strike them down. When he was younger, he was taught many techniques by the Second and Third Hokage. His training under the Second has given him highly proficient skill in high caliber water release techniques, allowing him to use techniques such as the Water Release: Water Dragon Bullet Technique and Water Release: Water Encampment Wall. He also learned the Shuriken Shadow Clone Technique from the Third Hokage. In addition to combat skills, Kosuke is a highly capable survival expert and cook. He was placed on a team alongside Hayama Shirakumo, Tekuno Kanden and Naruto Uzumaki to guard the borders of the village after Orochimaru and Sunagakure's invasion of the village. He remarked that Minato had left behind a fine son, showing that he was one of the few people who was aware of Naruto's lineage.